The Hacienda Malagana is located in the municipality of Palmira in Colombia‘s Cauca Valley, about twenty minutes from Cali. In late 1992 (some reports say January of 1993), the hacienda’s land was leased by Ingenio Providencia S.A., a sugar company which used the property for growing sugarcane. One day the ground gave way underneath a farm worker who was driving a tractor through the cane field. The worker (and the tractor) fell into a pre-Conquest hypogeum and gold objects were clearly visible within the hole. These objects represented the work of a previously-unknown culture now referred to as the Malagana culture who lived in region from approximately 300 BC to 300 AD. The farm worker removed and sold some of the gold objects from the tomb. This action did not go unnoticed by the local community and as many as 5,000 people (El Tiempo 1993a) descended upon the cane fields of Hacienda Malagana to loot the site in a scene likened to a ‘gold rush’. According to Colombian news sources, looting began at Hacienda Malagana on 28 December 1992 and authorities did not formally hear about the looting until 21 January 1993 (El Tiempo 1993b).At least one person was murdered during the ‘gold rush’ and as much as 200 kg of gold artefacts were removed from the ground in a number of weeks. Hundreds of tombs were destroyed during the looting (Drennan 2008). The Colombian army was called to the hacienda in January 1993 and remained at the site for fifteen days. They were unable to secure the site and the units were eventually called to public order operations in other parts of the valley (El Tiempo 1993a). Police units arrived on 9 March 1993 to try again to remove looters from the site. Police checkpoints were installed around the fifty hectare site, but they were not able to quell the looting (El Tiempo 1993a). Rescue excavations were first attempted in March 1993 by archaeologists from the Instituto Vallecaucano de Investigaciones Científicas (INCIVA) and the Instituto Colombiano de Antropología (ICAN) (El Tiempo 1993b). Four tombs were scientifically excavated at that time but archaeologists quickly abandoned the site due to the difficult security situation (El Tiempo 1999). Subsequent and extensive excavations conducted in 1994 clarified the occupational sequence of the site and confirmed that although the ancient people of Malagana conducted trade with other groups in the region, such as with the also heavily looted sites of San Agustín and Tierradentro, they had their own distinct iconographic style. Bogotá’s famous Museo del Oro, an offshoot of the Banco de la República, received a number of gold objects from Malagana as early as the latter part of 1992 according to some reports. In an effort to recover as many objects from the looting as possible, over 150 pieces of Malagana gold were acquired by the museum. This decision has been criticised by some editorial pieces: the museum spent around 500 million pesos on objects that they knew to have come from looters (El Tiempo 1993b). However, by combining first-hand accounts of the looting of individual tombs with information from the objects in their possession, the museum has been able to reconstruct the artefact assemblages of 29 graves from Malagana to some degree. This has provided limited contextual information for the artefacts. Although the Museo del Oro was able to buy many Malagana objects, an unknown number of artefacts left Colombia and entered the international art market. Two examples can be found in the collection of George Ortiz. One of the pieces in question is referred to on the website of the George Ortiz Collection as “267bis. Godzilla’s Realm”, presumably because the gold animal figure resembles a dinosaur (The George Ortiz Collection Website n.d.). The catalogue entry for these objects openly records their findspot: ‘Provenance: El Bolo, Cauca Valley (Colombia) “Malagana” related to Calima Culture’ and ‘[t]he Pre-Columbian treasure of El Bolo is called the Malagana Culture after the hacienda where found’ (The George Ortiz Collection Website n.d.). In an attempt to document some of the objects from Malagana that have not surfaced since they were removed from Malagana, the Universidad Nacional de Colombia’s Research Group on Human Factors and Ergonomics in Palmira has begun to collect images of lost artefacts. Although most of the pieces found by local looters were sold, many photographs of the objects are known to exist among the residents of El Bolo (Agencia de Noticias UN 2012). The aim of this project is not only to record lost Malagana iconography, but also to use the designs from these objects to develop a line of products that the local community can market and thus “rescue the intrinsic value” of the culture (Agencia de Noticias UN 2012). In other words, the project seeks to make the preservation of Malagana culture profitable to potential looters. Over 180 photographs of lost objects have been collected by researchers and these images have been displayed locally. The Hacienda Malagana and the area surrounding it still experiences incidences of looting. In 1999, the newspaper El Tiempo reported that as many as 100 to 300 looters could be found digging around the Hacienda Malagana on any given weekend (El Tiempo 1999). In February or March 2012, looters working in a cane field near the village of La Trocha located two pieces of Malagana figural ceramic. Locals reported that men from Palmira, presumably antiquities trafficking intermediaries, took the objects away (El País 2012). These objects were apparently found outside the protected area managed by the Fundación Cultura Malagana, again in a cane field (El País 2012). Agencia de Noticias UN (2012), ‘Diseños rescatan cultura Malagana’, Agencia de Noticias UN. <http://www.agenciadenoticias.unal.edu.co/detalle/article/disenos-rescatan-cultura-malagana/index.html>, accessed 7 August 2012. Drennan, Robert D. (2008), ‘Chiefdoms of Southwestern Colombia’, in Helaine Silverman and William H. Isbell (eds. ), The Handbook of South American Archaeology (New York: Springer), 381-403. El País (2012), ‘Se conocen nuevos hallazgos de la cultura Malagana en Palmira’, El País, 12 March. El Tiempo (1993a), ‘Desalojan a Guaqueros’, El Tiempo, 10 March. — (1993b), ‘Malagana de demanda en demanda’, El Tiempo, 19 August. — (1999), ‘Los Tesoros Perdidos’, El Tiempo, 11 July. The George Ortiz Collection (n.d.), ‘”Godzilla’s” Realm’, Website of the George Ortiz Collection <http://www.georgeortiz.com/ortiz_test/lindexh.asp?itemid=h2670>, accessed 27 April 2012. Early reports use the term “Los Bolos culture” after the closest village to the Hacienda Malagana. Malagana is also sometimes assigned to the Yotoco culture or discussed as closely related. Here I use “Malagana” to mean objects that came, specifically, from the vicinity of the Hacienda Malagana. 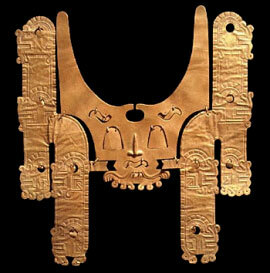 If the site was first looted in December 1992, it is possible that the Museo received gold objects that month, however it seems more likely that the objects turned up there in early 1993.